EMPASO ® TeamCrate | Standard sports bottle carriers 12 x 750cc. Order below your standard EMPASO TeamCrate sport bottle carrier set including 12 sports water bottles 750cc. 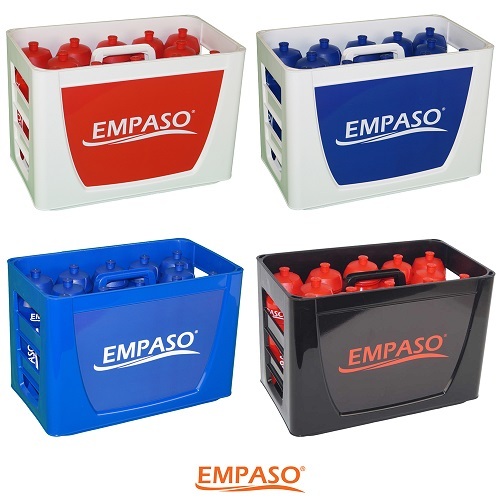 Our standard EMPASO TeamCrate is available in four different crate – bottle colour combinations: white-blue, white-red, blue-blue and black-yellow. The action price this month for a standard TeamCrate including 12 EMPASO sports bottles 750ml is € 49,90 54,90 including VAT. The DHL delivery costs delivered to the UK and Ireland are € 19,95 incl. VAT. and the DHL delivery time is about 5 to 7 working days. Thursday is our fixed weekly shipment day. You can order your standard TeamCrate via the order form below. Fill in the form and submit your order. Within two working days you will receive an order confirmation and invoice by mail and the delivery time starts after you’ve paid the invoice. Fill in your name and contact details. If you have another delivery address, mention this at the field "Remarks". Specify below the details of your order and additional options. Number of standard TeamCrates * One (1) TeamCrate standardTwo (2) TeamCrates standardThree (3) TeamCrates standardFour (4) TeamCrates standardFive (5) TeamCrates standardMore than 5, specify at "Remarks"
Let us know how many TeamCrates you are ordering. For more info see our webpage 'TeamCrate Options'. Numbers for sports bottles: * No, I do not order numbers for sports bottlesYes, one (1) set bottle numbers 1-12 (€6,00)Yes, two (2) sets bottle numbers 1-12 (€10,00)Yes, two (2) sets bottle numbers 1-12 & 13-24 (€10,00)Other, specify at the field "Remarks"
Is very hygienic! Let us know if you want to order number sets for the bottles and closures. CoachBoard with black board marker: * No, I do not order a CoachBoardYes, I order a CoachBoard FootballYes, I order a CoachBoard Field hockeyYes, I order a CoachBoard RugbyYes, I order a CoachBoard VolleyballYes, I order a CoachBoard KorfballYes, I order a CoachBoard BasketballYes, I order a CoachBoard HandballYes, I order a CoachBoard WaterpoloYes, I order a CoachBoard FootballOther, specify at the field "Remarks"
Order a CoachBoard which into your TeamCrate. Promo price € 11,85 instead of € 15,55! TeamTray for the 3d half: * No, I do not order a TeamTrayYes, I order one (1) red TeamTrayYes, I order one (1) white TeamTrayYes, I order one (1) black TeamTrayYes, I order one (1) green TeamTrayOther, specify at the field "Remarks"
Order a TeamTray which fits on top of your TeamCrate. Promo price € 11,85 instead of € 15,55! Submitted your order? Then you will receive directly a short email from us in order to verify your email address. Didn’t you received our e-mail? Check first your spambox! If you also didn’t received it in your spambox, then something went wrong and you need to submit your order again.